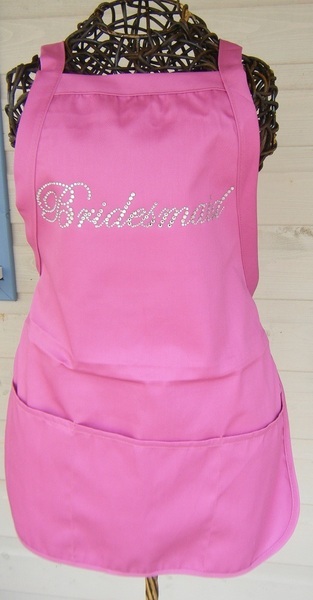 This practical pink apron features a stunning rhinestone 'BRIDE', 'Bridesmaid' or 'Mother-of-the-Bride' across the chest in sparkling crystals. This is an ideal apron to wear on modern hen-nights where the girls get together to try different activities from flower arranging to cooking, nail painting or even paintballing. These aprons help to theme the occasion whilst keeping the 'good' clothing underneath protected. They still look cute too! They are also worn to protect the clothes on the morning of the wedding when the bridal party are having their hair and makeup done and they look really great in the photos. This apron is £14.00 plus shipping and handling. These are cute wonderful aprons for any bridal party. It keeps everyones clothes all nice and clean for the perfect day! The pockets in the front are great to hold any things that you may need from safety pins to wipes. Buy Cute Aprons is a family owned online retail store, founded by Kirsteen Mackay and operated from Ross-Shire, in the Scottish Highlands, UK. How Buy Cute Aprons began.... We set up Buy Cute Aprons in February 2011 after noticing that these fun and elegant styles of aprons were becoming decidedly popular in the United States, but the availability of cute and elegant aprons in the UK was few and far between. The majority of our aprons are handmade to order and all the designs are ultra cute and perfect for giving the wearer a unique sense of style whilst tending to their chores.